← Announcing the winner of our t-shirt giveaway! 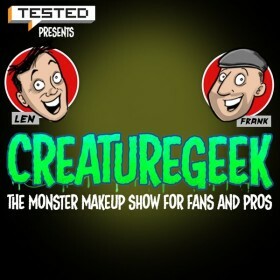 To finish off our month of Podcast recommendations, today our Follow Friday recommendation is CreatureGeek, the ‘Monster Makeup Show for Fans and Pros’. Led by special effects maestro Frank Ippolito and artist/illustrator Len Peralta, and presented by the team behind Jamie & Adam Tested, CreatureGeek is a show packed with discussion, hints and tips and interviews from the people behind some of the greatest practical special effects in cinema history. Discussing topics as diverse as the history of some famous names in special FX, animatonics, thoughts on CGI-augmented practical effects, the best make-up effects currently in film and TV, and much more, this podcast is a wealth of interesting tidbits and hints for anyone interested in the art of make-up and effects. Previous guests on the show include Rick Lazzarini of The Character Shop, Matt Winston of the Stan Winston School of Character Arts, Michele Burke, Bill Moseley, Shannon Shea, Jim Eustermann, Todd Masters of MastersFX and many more. Whilst they are currently between seasons, there are still hours and hours of listening to be had, with each episode on around 45 minutes long. For more information on CreatureGeek, visit their website, creature-geek.com, or follow them on Twitter at @CreatureGeeks. You can find CreatureGeek, along with many other podcasts (including our own) on Podbay.fm – a podcast aggregator which collects together reviews, stats and more to help you find your next podcast. In addition, they offer apps for both Android and iOS so you can listen to podcasts on the go!